An ex-cop, framed for a murder he didn't commit, sets out to find the real killer. Two words "Rampart Scandal". 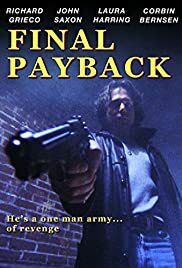 Final payback is the kind of movie you see is if you've ever heard of the rampart scandal and wondered why it happened. Just like that scandal there are no real winners but a lot of empathy for both sides. Richard Grieco is excellent as a washed up cop who quits in disgrace over moral issues and Martin Kove is equally great as his nemesis. Overall the cast is quite good for a low budget feature. Corbin Bernsen, John Saxon, Pricilla Barnes and Laura Harring rounds out the cast of actors. The film is well written and directed and overcomes many of it's failings by the stylish directing and purposely gritty cinematography.